To celebrate #OurDay today, we’re taking a closer look at the work of elections teams at local authorities. Tanya Rowlandson, Electoral Services Officer for Broadland District Council in Norfolk since 2008, has shared some details of what her job involves. I work in a small team so my job can be quite varied; I enjoy the challenges of the election period when things can get a bit manic. But we have a great team spirit and camaraderie that gets us through it all. Day to day I’m dealing with the applications received via the IERDS, using council tax records to review registration entitlement, assisting with the annual household canvass and then, of course, helping with the preparations for all elections (staffing, polling stations, nomination papers and the count). We don’t have a call centre, so I will deal with queries from the members of the public, other council officers, members and town/parish clerks. At the moment, we’re busy preparing to publish a new electoral register by the 1 December deadline. We’ve had over a 90% response rate for this year’s canvass but some people still don’t register until a general election is announced or they want to improve their credit rating. Our Parliamentary constituencies cross boundaries with Norwich City Council and North Norfolk District Council. We’ve previously been the lead authority for both constituencies, for the June 2017 General Election, our combined electorate was 144,258 and we issued 27,366 postal votes in-house. During an election, managing elector expectations can be challenging. Some people think they can vote online and many don’t realise how much work is involved in arranging postal votes. It can be frustrating when someone phones and admit they’ve ripped up the ballot paper because they thought it was for a local election, mislaid it or their dog has eaten it and want a replacement. We’ve had to advise an overseas elector to retrieve the pieces from their bin and tape it together and return it immediately in order to make the polling day deadline! We work flat out on polling day. We’re usually in the office at 6:15 am – ready to deal with any queries from our Presiding Officers and from voters who are trying to find their polling station or want to know the reason why they’re not registered to vote. We’re also dealing with all the postal votes handed in at the stations; or at the count. Once they’ve all been scanned/processed- it’s a quick drive to our count venue to get stuck in with counting the votes which can go on until 5-6am the next day. Transparency is a guiding principle for us at the Electoral Commission. We believe voters should be able to see and understand how political parties and campaigners are funded; how they spend their money; and who they target with campaign materials. The rules set out by Parliament, which we enforce, state that political parties and campaign groups must provide us with information on donations and loans, campaign spending and annual accounts. We then publish the information via our easy to use, searchable database. For us, our role is not just about publishing political finance information, it is about ensuring this information is easy to access and open to scrutiny. We believe this increases public trust and confidence in our democratic process. Until recently, these rules did not extend fully to Northern Ireland. While political parties in Northern Ireland were required to provide us with the same financial information, we were not permitted to publish or share anything about donations and loans to these parties. A major milestone in addressing the lack of transparency in Northern Ireland political finance came last year, when legislation was introduced allowing us to publish details of donations and loans to Northern Ireland parties, received from July 2017 onwards. While this is an encouraging start, it is vital we don’t stop there. Prior to this change in legislation, we dealt with donation and loan information from Northern Ireland differently, for publication purposes, but it was still subject to rigorous compliance checks by us. This means checking donations to political parties in Northern Ireland to make sure they come from a permissible source. Failing to return an impermissible donation within 30 days can be an electoral offence and where we find evidence that this has happened we take action in line with our Enforcement Policy. If that means an investigation, we then publish its outcome even if we cannot publish details of the donation itself. However the Commission continues to be prevented from disclosing any information concerning donations to political parties in Northern Ireland made before 1 July 2017. To do so would be an offence with serious penalties for the Commission and our staff. This makes it extremely difficult for us to discuss and share information about how political parties in Northern Ireland are funded. A lack of transparency is not good for our democracy and prevents the public from having important information on how their political parties are funded. That is why we welcomed the change in the law last year but also why we continue to call on the Secretary of State for Northern Ireland to introduce further legislation to enable us to publish the information we hold from January 2014. This was the government’s original intention when the law was changed in 2014. At that time we advised political parties to make their donors aware that all donations made from January 2014 could be made public in the future. Extending the transparency rules to 2014 would open up a period of intense electoral activity to scrutiny, taking in two UK parliamentary general elections, two Northern Ireland Assembly elections, EU and local government elections and the EU referendum. Transparency for these significant electoral events would do a great deal for voter trust and confidence in the democratic process. Young people are far less likely to be registered to vote than their older counter parts – across the UK 1 in 3 of those eligible to vote under the age of 24 aren’t registered. In addition, those who’ve recently moved and those who live in privately rented property are much less likely to be registered than people who’ve lived in a house that they own for a long time. Young, mobile, and likely to live in rented accommodation – university students are a group that often pose challenges to Electoral Registration Officers whose task it is to ensure the accuracy and completeness of the register. Despite this, there are a number of ways your team can engage students. Universities can be vital partners in encouraging student registration. Building relationships with university staff could help you identify where they may be able to help. For example, there may be opportunities for them to include registration information in enrolment documents, or introduce the topic at welcome briefings. In addition, touch base with halls of residence and scope the possibilities for sharing information of the students living in the properties. An engaged halls monitor may also raise the message face-to-face with students and be an ambassador for your message. You can also look into using data readily available to you, such as council tax documents. These detail properties which are exempt because they house students, so you can begin mapping areas to focus your efforts. We can provide plenty of resources to help you encourage the students in your area to register to vote. We’ve got a dedicated webpage on sharing good practice for reaching students, as well as detailed guidance on reviewing and updating your public engagement strategy and registration plan. To stay up to date with our latest resources, sign up to our voter registration newsletter, Roll Call now. Today we’ve launched our new consultation on the Codes of Practice on election spending for candidates and political parties. We want your input to make sure they’re comprehensive, promote consistency, and provide the necessary clarity you need. We hope these Codes will make it easier for you to submit your own or your party’s returns, simplifying the process and removing any blurred lines that there might have been. It will also help to increase transparency in the spending and reporting of expenses at elections and in turn help increase voter confidence in the system of political and election finance. With two general elections in quick succession, we understand that the demand on candidates, agents and parties has been high. After the 2017 general election we received over 3,300 candidate spending returns totalling over £14 million. We also received 69 political party returns, detailing over £39 million worth of spending. So simplifying this process will benefit a huge number of people involved in spending returns. In responding to this consultation you’ll help us to further demystify the process and remove any confusion that you or your party may have over the process of campaign reporting. To inform the Codes, we’ve drawn on our experience as a regulator and also from the views of parties, candidates, and agents to make sure that these Codes will be as helpful for you as possible. ensure the reporting of spending, including digital campaigning by political parties and candidates is clear and consistent. The Codes set out what is and isn’t included in the categories of spending for elections and allow us to give guidance on the cases and circumstances where spending will be regarded as contributing to a candidate’s election or alternatively to the promotion of a party. We’ve set out a number of questions to assist in consultation responses, including ‘Are the Codes easy to understand?’ and ‘Do the Codes cover all the types of spending on digital campaigning at elections?’ but we also welcome and encourage any further feedback you may feel relevant. Once finalised, these Codes will be presented to the Minister for the Cabinet Office for consideration before being laid before the UK Parliament for approval. When in force, political parties, candidates and agents must abide by the Codes when they organise their campaigns and when they complete their spending returns after an election. The Scottish Parliament has responsibility for the law on Scottish Parliament and Scottish local government elections whilst the National Assembly for Wales has responsibility for the law on Assembly and Welsh local government elections. We anticipate also developing Codes appropriate to those elections, which will be subject at that time to consultation. We welcome responses before Tuesday 4 December. You will find the consultation questions on page 7 of the consultation document. You can also view the Code of Practice for candidates and the Code of Practice for political parties. Responses can also be submitted by phone to Denise Bottom on 0207 271 0638. Everyone should be able to participate in elections and cast their vote with confidence, but this is not always the case. Even though they have the right to vote, some people face barriers to taking part in our democratic process. Our electoral system needs to be made accessible to all. That is why we welcome the UK Government’s recommendations, announced today, and are keen to see improvements made as soon as possible. The recommendations, which aim to help make elections more accessible to voters with a disability, are the product of a call for evidence from the UK Government. 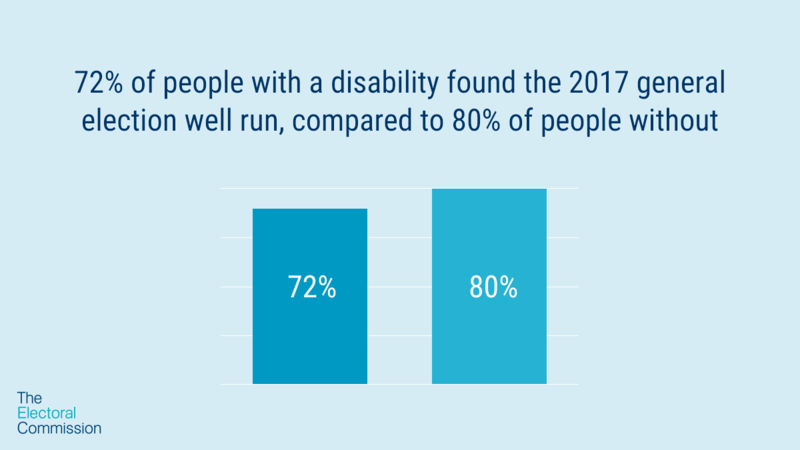 Our report ‘Elections for everyone’ found that people with a disability are less likely to find elections well run. This has to change. After the general election last year, we undertook research with voters that have disabilities to inform our report, Elections for everyone. We heard testimonials from voters with learning and physical disabilities and people living with mental illness, about their experiences of registering to vote and voting. We also spoke to a number of charities as part of our research. While most voters are happy with registering to vote and voting in the UK, not all voters with disabilities had a good experience. This must be improved. We submitted our report as evidence and made recommendations to the UK Government, political parties, candidates, electoral administrators, carers and support workers on what they can do to make elections more accessible. We also committed to stepping up our work with everyone involved in running elections to help ensure there are no barriers to voting. We are pleased that the UK Government has used the evidence we provided for the recommendations they have released this week. We will continue to do what we can to see the recommendations put into action. This includes strengthening the support we give to electoral administrators so that they can help people with a disability to register and to vote. Ensuring that nobody faces barriers to voting is very important, and collaboration and cooperation will be key to overcoming the issues voters have told us about and ensuring that elections are for everyone.